Sometimes a good deed is rewarded simply by the warm glow a person gets with the knowledge that you’ve made someone’s day; at other times the reward is more tangible and, in fact, far outweighs the original kindness. This is a story of one of those times when a random act of thoughtfulness leads to a wondrous adventure. It all began a few weeks ago when my 13-year-old nephew, BJ, was looking through my father’s collection of records. BJ was most fascinated with the little 45s with their yawning middles, and didn’t understand how - with their large center holes - they could be played on a regular turntable. We did our best to explain about the plastic “doohickeys” that we used to press into those center holes, if we didn’t have the chubby cylinder that converted the skinny spindle to the right width to hold them. Needless to say, since we didn’t have a plastic doohickey to show him, his understanding was not too complete. In Sacramento, our first stop was Old Town, a partial preservation and recreation of the original gold rush era Sacramento on the shores of the lugubrious Sacramento River. There one can wander covered boardwalks leading into many interesting shops and restaurants. A few of those shops offer vintage items and collectibles. It’s been a while since we last visited, so we were happily re-acquainting ourselves with the familiar places and checking out what was new. We crossed through a narrow doorway into a slightly shabby and dingy ramble of rooms. Everywhere were waist-high bins bursting with records, but not ordinary records. These bins were filled by 45s with wide-open center holes, and albums of such late greats as Frank Sinatra, Elvis and Peggy Lee. “Certainly,” I think, “I can find a plastic doohickey for my nephew in this place, even if I have to buy a 45 to get one.” However, the clerk is busy with other customers, so we decide to look around. The shop is a rabbit warren of rooms all bumping up against each other. A side room has some fabulous 1930s and 40s slot machines and even a late 50s juke box; another has unopened boxes, as well as another batch of slot machines waiting for a final polish. Further into the shop, and off to the back of its large center room is a smaller room, something the size of a not-too-big walk-in closet. There is a slightly skewed sign on the wall that proclaims, “78 Room.” From a distance I can also see there are records of many sizes tacked to the wall… at least one of them looks like… it… might… be… could be… IS… a 16-inch disk! Drawn, I walk closer. What fan of old time radio could resist such a lure? 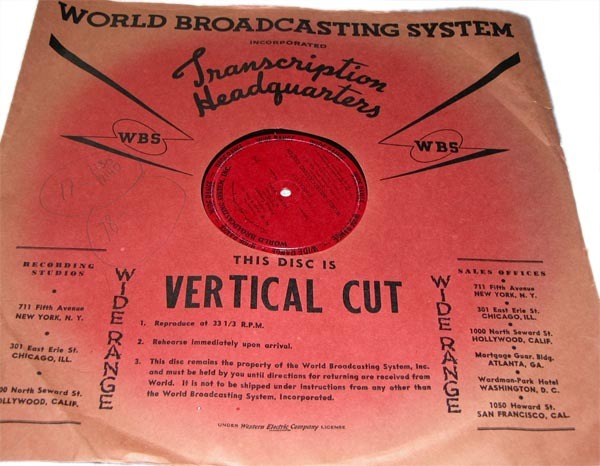 Now, let me pause to say that I have never actually considered I’d see a 16-inch radio transcription in any kind of decent condition. Until this point the only one I’ve ever seen was in a phonograph museum in Virginia City, Nevada and that poor thing was in tatters. Its aluminum base was clearly showing through where large flakes of black recording surface had peeled away. What was left was cracked and there was little doubt that nothing useful could be captured from that poor survivor. So, I approached slowly and with breath held, prepared to feel foolish when this record turned out to be something entirely different and ordinary. It hung, naked, from a pushpin pressed into the wall. 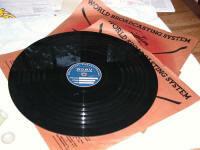 I carefully removed the record and, cradling it by the edges pressed into my palms, I looked it over. 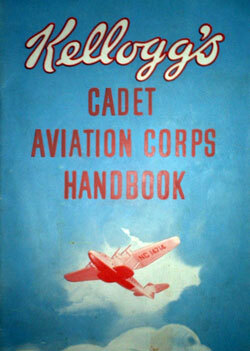 The typed areas give additional information: Program: Kellogg Bran Flakes, Speed: 33-1/3 (PROG. 7-13), Time: 1 MIN. MUSICAL. 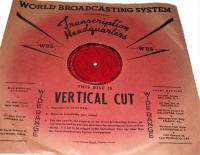 The flip side of the record has similar information printed on an almost identical blue label, but the program numbers are 1-6. Each side of this recording has 6 short ‘cuts.’ I assume these are commercial jingles. This looks ‘real’ to me and I look up, wondering if there might be more. A glance toward the opposite side of the tiny room turns up another oversized record, but this one is in an aging dust sleeve, and the label showing through the center opening of the dust sleeve is red. After carefully hanging the Bran Flakes transcription back on its pushpin I reach for the red-labeled recording. The label confirms it is another transcription. The lighting in the room is not too great and the black printing, in low contrast to the red background, is difficult to read, but I can make out the words “Howie Wing” and “World Broadcasting System,” along with the words “Vertical Cut.” By squinting a bit, I also can make out a copyright date of 1938 and a program number of 82. Over the past few years, I’ve collected thousands of Old Time Radio shows, but I’ve never heard of Howie Wing, so I wonder, “Are these real?” I slip the recording out of the dust sleeve to inspect it further. It’s shiny black, looking almost new. 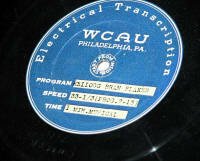 Could an almost 70-year-old record look this good? What if they are fakes? My lack of expertise is no help, but it seems ludicrous that anyone would bother to counterfeit old radio transcriptions. I look around a bit more and uncover two more transcription disks with red labels in identical dust sleeves. They also say “Howie Wing” on the label, but have different episode numbers. I decide to take a chance and buy them, if the price isn’t too high. It’s not, and yes, I do ask if there are others, but I’ve apparently found all there were to find. 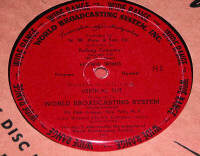 So now I am the proud owner of four apparent radio transcriptions disks, one of which may be commercial jingles and three others that may contain 6 episodes of something called “Howie Wing” from 1938. How in the world do I figure out what they are and what’s on the recordings? In the next issue of RADIO RECALL, Kathy will recount how she locates Jack French and Jerry Haendiges to help her puzzle out just what she has found... and shares her joy in hearing, for the first time, several episodes of a 70 year old radio show presumed lost in history.